We have a selection of mobile bars available to hire for your event and are all of a bespoke and elegant design exclusive to us. They can be branded with your company logo or design of your choice, and are available to hire on a ‘cash bar’ basis or ‘dry hire’ basis. Guests pay as they go. There are a variety of packages available as a cash bar. 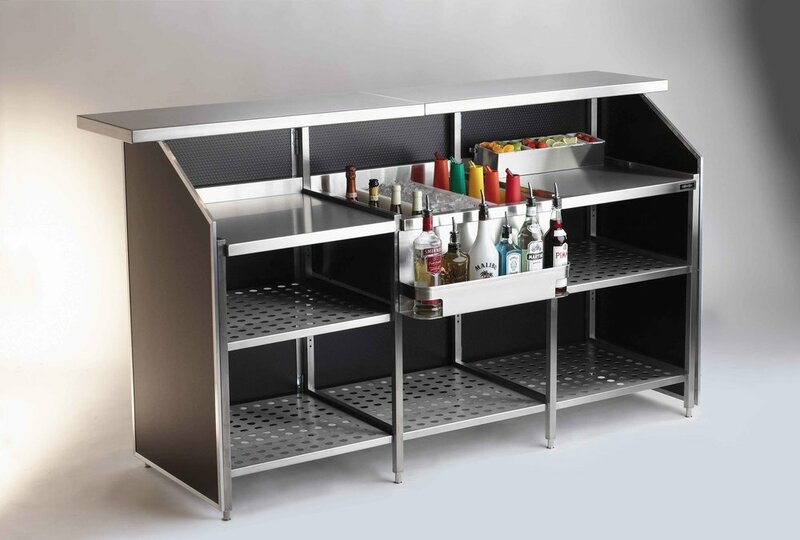 You simply hire the bar and any equipment from us. We will deliver the bars to you and collect them when you’re done. Exactly the same as dry hire but we will also staff the bar so your guests can enjoy drinks expertly served. The Whole Shebang! - Book this package and let us do the hard work! Leave us to keep your guest’s glasses filled with what they like, without having the stress and hassle of wondering if you have brought enough of the right booze! This package provides your guests with a ‘full bar service’ stocked with everything from Local Beers and Ciders, Wines and Fizz, Cocktails, Spirits and Minerals. Includes a choice of Bar, bartender, all stock, juices, garnishes, elegant glassware and barware. Guests can either pay as they go, or the client can pre pay a tab in advance. Strictly Cocktails - As above, we provide a choice of bar, bartender, all stock, juices, garnishes, elegant glassware and barware. We will provide a selection of Cocktails chosen from our Signature or Classic Cocktails Menu. Guests can either pay as they go, or the client can pre pay a package price. Atmospheric Cocktails - Book this package and really get their tongues wagging! Immediately impress anddelight your guests. Think fire, smoke and a little bit of sparkle! This package really ups the ante. We will provide a selection of Cocktails chosen from our Signature, Classic & Atmospheric Cocktail Menu. Includes a bar, bartender, all stock, juices, garnishes, elegant glassware and barware. Guests can either pay as they go, or the client can pre pay a package price. Please note this is just a selection of our most popular packages. Have an idea you’d like to run with? We can create concept bars, menus & drinks all to suit your theme. In addition you can expand your experience with an extra Cocktail Master class or Table and Toast Drinks. Cocktail Master Class - Our talented bartenders introduce you to the world of Mixology and Cocktails. Learn as they lift the veil on some of the industries best-kept secrets, your favourite cocktail recipe or simply a trick of the trade. Make, taste and experience 3 Classic Cocktails and 2 Signature Cocktails, relaxing with friends in the comfort of your own home, in the office, or anywhere in between! Let us bring the party to you. Includes Cocktail Games, ‘Goodie Bags’, bartender, all stock, juices, garnishes, elegant glassware and barware. You can also upgrade your cocktail masterclass, for further information please get in touch. Table and Toast Drinks - We have several packages available to suit your budget and requirements, or you can throw away the rulebook and create your own package. Our wines are hand selected from our Wine Merchants who deal directly with independent growers importing wines from all over the world. As part of your booking with us we will take great pleasure in offering wine tasting to give you the opportunity to taste each of the wines, and even match them with your chosen food menu. For all prices and enquiries, please get in touch!